I’m in love…with a granola bar! My name is Porsha and I have an obsession. One that just can’t be helped. These granola bars are so YUMMY! You won’t even realize that they are healthy. I try to eat as healthy as I can. The key word is try. I’m a vegetarian which makes eating healthy much easier, right? So, my eating a bunch of meatless chocolate is perfectly acceptable. 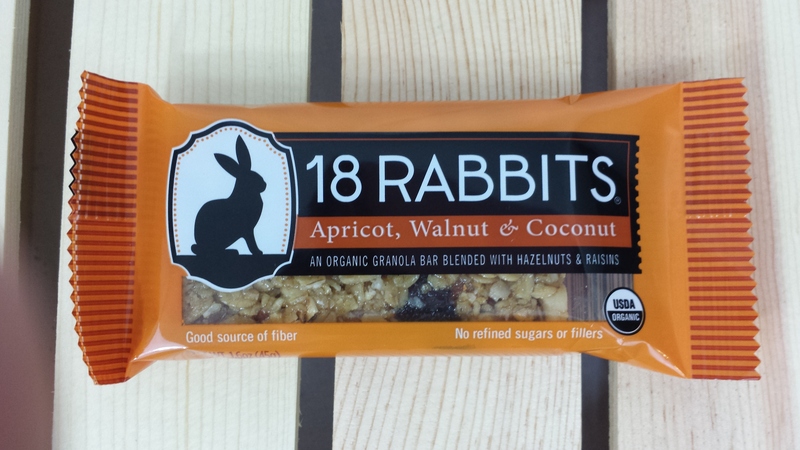 Seriously, with all natural ingredients and great flavor combinations, 18 Rabbits (Isn’t that the cutest name? There’s a whole story behind the name. Check out their website for more info and products) is staying on my pantry shelf. My favorite flavor is date, pecan, and coconut. I don’t have a picture of that particular flavor. I finished eating them before I decided to write this post. I got my granola bars from Costco in a 15 pack with five bars of each flavor (date, pecan, coconut/apricot, walnut, coconut/fig, cranberry, hazelnut). You’ll have to ask hubby for the price but I’m pretty sure they are pricey – the one downfall. Have any of you tried these granola bars? if so, what’s your favorite flavor? Peace, love, and granola bars! This entry was posted in Recipes and tagged 18 rabbits, granola bar, healthy, organic, vegan, vegetarian.